One of the things I depend on wholeheartedly in the morning is a great cup of coffee. I'm not a morning person in the least, so without a cup of coffee, it seems to take forever for me to get my gears going. Sometimes though, I find myself needing even more than just one cup of coffee. This has led me to discover the wondrous deliciousness of espresso. Bialetti's Moka Express is the world's number one coffee maker and can be found in over 90% of Italian households. Keep reading to learn more! I reviewed the Moka Express 6-Cup Stovetop Espresso Maker from Bialetti, which retails for $29.95, but is currently on sale for $27.48 with FREE SHIPPING. 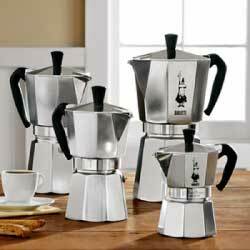 When Alfonso Bialetti revolutionized home coffee brewing in 1933 with his patented Moka Express, Italy was in the midst of an economic crisis. Families were forced to cut back on many of their luxury purchases. Today, more than 75 years later, consumers are still faced with the same dilemma. With the advent of the $4 cup of coffee and home espresso machines costing up to thousands of dollars, coffee lovers are rediscovering why Bialetti’s Moka Express is the most economical option for creating delicious espresso drinks at home. The Moka Express is available in 1, 3, 6, 9 and 12 cup sizes and couldn't be easier to use. It's composed of durable polished aluminum and comes complete with just three pieces: the bottom chamber, the coffee funnel filter and the upper chamber. First, simply fill the bottom chamber with cold water to the fill line. Next, fill the coffee funnel filter with ground coffee. You may want to experiment with the fineness of the grounds you use. I just started using the Moka Express and have read that some people experience a better cup of coffee by using more coarsely ground coffee versus the finer grounds. Assemble all three pieces together and place on the stovetop. Finally, heat the Bialetti Moka Express using low heat from your oven's range and in just 4-5 minutes, you'll have a steaming pot of espresso. There's a pressure release valve on the side of the bottom chamber which serves as an additional safety feature. As the coffee is being prepared, you'll hear it percolating inside the Moka Express. You'll know that the coffee is finished brewing once you no longer hear it making noise inside the chamber. I was very happy with how quick and easy it was to make a fresh, piping hot cup of espresso with the Bialetti Moka Express. This coffee maker is perfect for travel too since it is so portable and doesn't require electricity. The Moka Express will definitely be accompanying my family on every camping trip we take this season. Finally, I can wake up with a smile on my face and rearing to go whether I'm at home or deep in the woods! Cleanup is also super simple. Bialetti recommends using just water to rinse out the three individual pieces of the Moka Express. What's more, because this coffee maker doesn't have any moving parts, there's no reason that this product won't last you and your family for many years. I highly recommend the Bialetti Moka Express as a great holiday gift for yourself or someone you love! 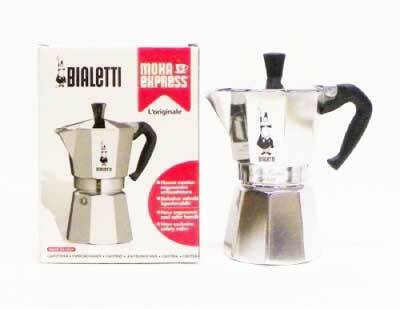 Disclosure: I received the Moka Express 6-Cup Stovetop Espresso Maker from Bialetti in order to facilitate my review. No other compensation was received. This product review is based on my own personal experiences with this item and is completely honest and objective.